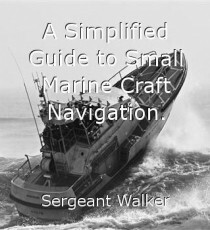 Without any doubt, the most useful singular instrument to navigation is the mariners own eyesight, since keeping a good lookout and the ability to identify objects, particularly at a distance, is so important to safe navigation. Therefore, any artificial aid to vision is a most important navigational instrument, and whenever a mariner puts to sea that same mariner should be equipped with a good telescope, or pair of binoculars. However, as the use of a telescope for Marine navigation is now practically obsolete this paragraph concentrates on the use of binoculars in navigation. The at times extremely harsh marine conditions impose some special requirements on the type of binoculars for use in the navigation of a small marine craft. Important requirements are that the binoculars' magnification must not be so great that the craft‘s movement or motor vibration will make the use of them difficult and tiring. They should also reduce or eliminate sunlight glare from the water, be sealed against moisture, salt and dust, and be suitable for light variations from high noon to semi-darkness. These requirements narrow the range of suitable marine binoculars down to about three types, the 6 x 30, 7 x 35, and the 7 x 50, all with coated lenses. These type numbers denote two important characteristics of a binocular. The first number refers to amplification, so that in this case an object viewed through this binocular will appear six times as large as when seen by the naked eye, or as one - sixth the actual distance away. If you were to raise this 6 power amplification to say, 8, then the object would appear only one-eighth the distance away. However, vibration and handshake would also have been increased, so that the navigational buoy number you were able to read quite happily at 1200 yards with the 6 power amplification, although now larger, may be jumping around so much as to be undecipherable. The second type number refers to the diameter of the object lens, the one furthest from the eye, expressed in millimeters. The larger the object lens the more light it can gather, and the ratio of this to the amplification factor determines the amount of light, which reaches the eye through the exit pupil, the eyepiece of the binocular. This means on a 7 x 35, seven times magnification and 35mm object lens, binocular the size of the exit to the eye is 35 ÷ 7 = 5mm. With a 7 x 50 binocular, the size of the object viewed will be the same as with the 7 x 35 because the magnification is the same, but the exit pupil is now 50 ÷ 7 = 7.1mm. The pupil of the human eye on a bright day contracts to 4mm. and after sunset dilates to approximately 7mm. Thus, during the day the viewer will not be using all the light that is available both barrels, but when the light dims at twilight his vision will be cut-off that much sooner with the 7 x 355 than with the 7 x 505. Another characteristic of binoculars is field of view, the diameter of the area seen through your binoculars at a given distance. This is usually expressed as the number of linear feet seen at a distance of 1,000 yards, although it can also be expressed as an angle. High-powered, high amplification, binoculars have a smaller field of view than those of low power because more of the object observed is filling the available space. The true field of view is determined by the field lens, not by the object lens. The field of view also varies according to the distance from which your eye is away from the eyepiece. There are at least ten, prism of lens surfaces, through which light must pass in binoculars and as much as 5% of light can be lost at each surface unless the lenses have been specially coated to counter this. It was discovered during the second World War that a fine coating magnesium fluoride reduced back reflections past the lens and prism surfaces, and not only eliminated most of the light loss, but also eliminated glare and so improved the efficiency of the binoculars. The barrels of binoculars have a joining hinge to permit adjustment for distance between the user's eyes, interpupillary distance, so that the view will appear in a single well defined circle. A scale is usually marked on the binoculars' center post, and by memorizing the personal setting, the mariner/navigator can quickly adjust for their own use. Binoculars are either center focusing or individual focusing. The center focus style of binoculars has both a thumb wheel between the barrels and an individual focus on the right hand barrel. To compensate for any differences between a user’s two eyes, the user looks through the left barrel and rotates the thumb wheel until the user obtains a sharp view. Then, closing the left eye, the user adjusts the focus on the barrel for a sharp view. The user can now use the binoculars by simply adjusting the thumb wheel for focus at any distance. On the individual focus style of binoculars each barrel is adjusted separately. These types of binoculars are more suitable for military and open boat use because they have fewer moving parts for water entry and subsequent corrosion, and because once adjusted, they remain in focus for all but close-up work. All other things being equal, the 7 x 50 style of binoculars meet all the marine requirements. The 6 x 30 binoculars are useful mainly for general spotting during daylight hours, and the midway 7 x 35 are generally for daylight use. Mom and her Toddler Son.